Slideshow: The world-famous German tuning company gets their hands on yet another Mercedes. Originally developed as a military vehicle in the late 70's, the Mercedes G-Wagen is now the longest produced vehicle in Daimler's lineup. From the get-go, the G-Class has focused on off-road capabilities while also offering extraordinary comfort and safety. Its boxy styling is instantly recognizable, and with high demand worldwide, even basic models exceed six-figure price tags. 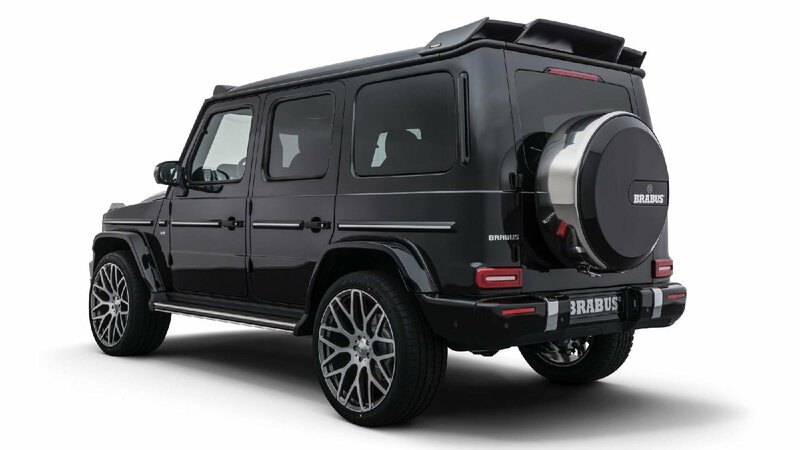 After years of refinements and updates, 2018 saw Mercedes introduce a new W463 generation G-Class that has been significantly improved over the outgoing models, but for companies like Brabus, there is always room for improvement. 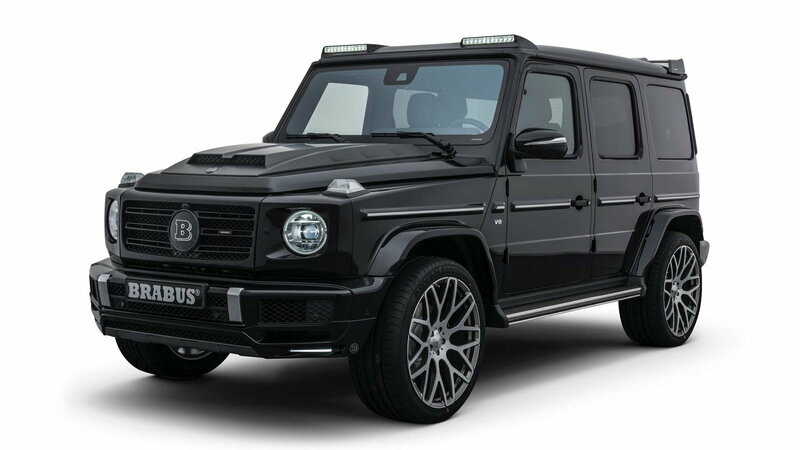 In this case, Brabus recently introduced their B40-500 G-Wagen based off of a 2019 G500. The 2019 G500 wagon is no slouch to begin with, as the standard 4.0L twin-turbo V8 produces a healthy 416 horsepower and 450 lb-ft of torque. 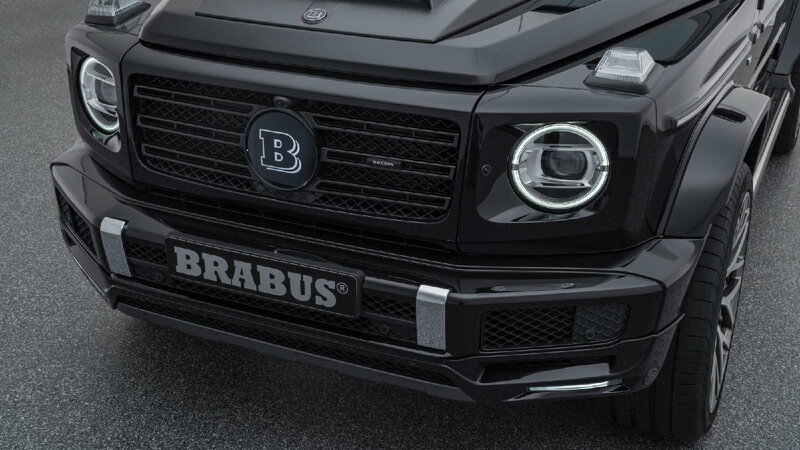 That said, Brabus was able to step things up with their PowerXtra performance package that extracts an additional 74 horsepower and 78 lb-ft of torque from the engine. The torque curve has also greatly improved with the maximum output spread from 2,250 to 4,250 rpm. 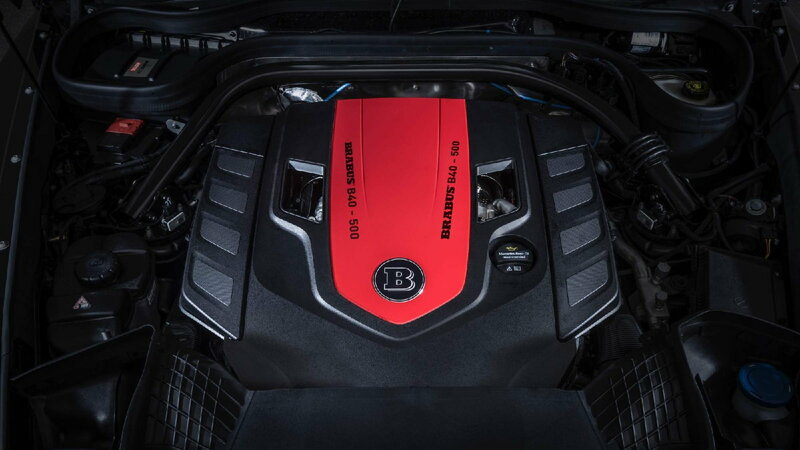 This is accomplished by Brabus' proprietary ECU software that remaps the ignition timing, boost pressure, and fueling among other parameters to increase output without the need of any additional hard engine parts. Brabus installs a larger set of their aluminum racing paddle shifters to the back of the steering wheel to give drivers a larger surface area to bang through the gears of the nine-speed automatic transmission. The last bit of performance comes from a sport-tuned exhaust setup with electronically controlled flaps to give comfort when cruising or a throaty bark when blitzing the backroads. All said and done, the PowerXtra kit sees the wagon making a stout 500 horsepower that is capable of 0-60 mph sprints in 5.7 seconds. Unfortunately, the big Box is still electronically limited to 130 mph. Styling has always been an important aspect of Brabus cars and the B40-500 is no different. From the front, a new fascia attachment, grille, and oversized hood-scoop have been added to create an imposing look for oncoming traffic. Out back, there is a stylish roof-mounted spoiler that is congruent in design with the auxiliary headlights fitted above the windshield. Each of these body attachments is made fully of carbon-fiber that can be had in a gloss or matte finish. Brabus will also offer customers their choice of forged monoblock wheels between 20-23" in size, but their premier wheel is the 23" Platinum Edition as seen here fitted with 305 section rubber. 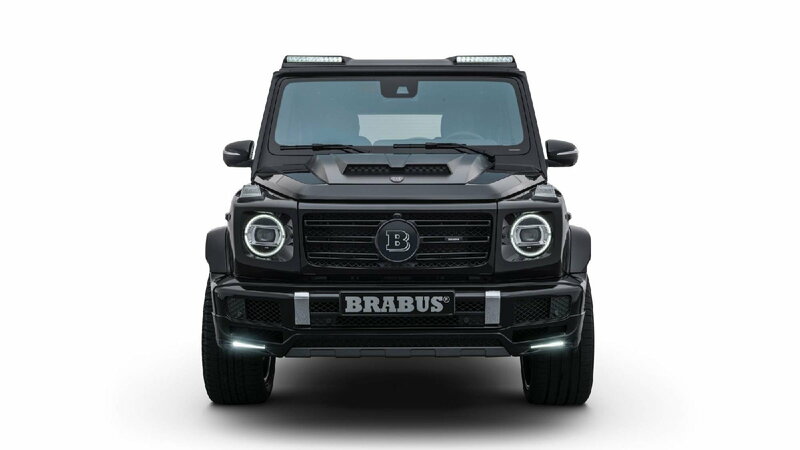 Some of the best lighting technology is found on Mercedes vehicles, but that did not stop Brabus from designing multiple lighting improvements for the G-Wagen that will prove especially useful if taken off-road. As mentioned, an auxiliary pair of LED headlights now sits above the windshield to provide additional lighting to the front of the vehicle, but they have also added new LED marker and running lights in the bumper as well as illuminated Brabus grille and bumper emblems. Finally, the B40-500 will allow buyers the option to configure the interior in just about any material and color combination they can imagine. Mastik leather and Alcantara are often popular materials of choice. Similarly, areas such as the dash, door panels, and center console can be adorned with aluminum, carbon fiber, or even exotic wood finishes. 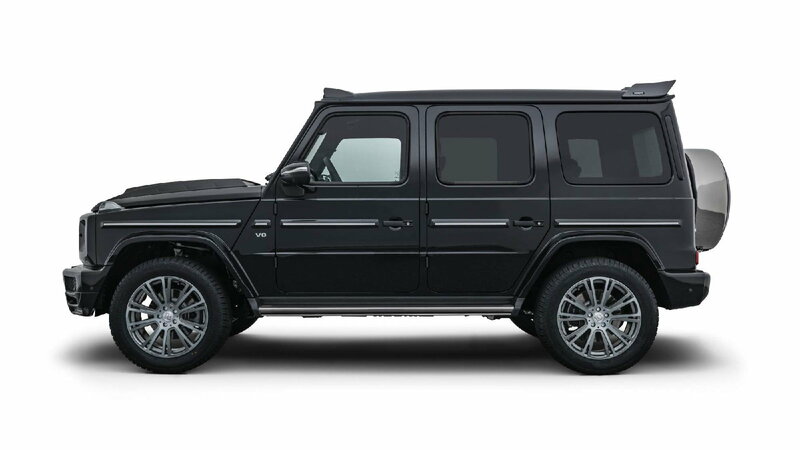 Pricing details for the B40-500 have yet to be released by Brabus, but considering the cost of the base G-Wagen is in the $125,000 range, most sources are expecting the vehicle to retail somewhere around $150k. What buyers of this package can expect is exclusivity and the ability to customize certain aspects of the car to their liking. Even better is that it will come with a three-year/62,000 mile warranty backed by Brabus. Overall, it is a highly capable luxury vehicle that builds upon an already popular Mercedes model and it continues to impress year after year.